When you make a gift to our annual fund, you’ll help the 40,000 Central Texans relying on our services achieve the proper nutrition necessary to support an active and fulfilled life. Thanks to the generous support of the Beaumont Foundation, you can double your impact this holiday season. Every dollar donated up to $100,000 will be matched. This means your $150 gift can provide 1,500 meals! Donations made today allow us to be there for military families like Sylvia’s. Sylvia's husband is a sergeant in the Army stationed at Fort Hood in Kileen. Financial hardships make life of a military family tough. Between paychecks, Sylvia nourishes her familiy with extra groceries from Operation Once in a Lifetime, a Capital Area Food Bank Partner Agency that serves active duty military, veterans and their families. No one should ever have to go hungry, especially during the holidays. With your donation, we can provide nutritious meals to families like Sylvia's and show them how much we appreciate their service to our country. GivingTuesday is our chance to make ending hunger a No. 1 priority. 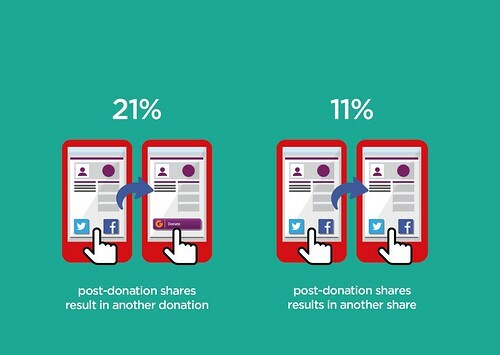 According to JustGiving.com, one in five donation shares will create another donation. One in 10 shares results in another share. When you share this blog post, you’ll not only encourage others to help end hunger with a donation, you’ll help spread the word about the great need for food assistance in Central Texas. Together, we can end hunger.